Chances are, if you’re like many Americans, you associate Canada—our friendly neighbor to the north—with one of three things: Universal health care, unfailing devotion to hockey or the use of “eh” to emphasize the end of a statement. Stereotypes are persistent, eh? But this winter, when you think of the land of the maple leaf, also think of sublime skiing and snowboarding. Canada’s Great White North boasts some of the best skiing on the continent. 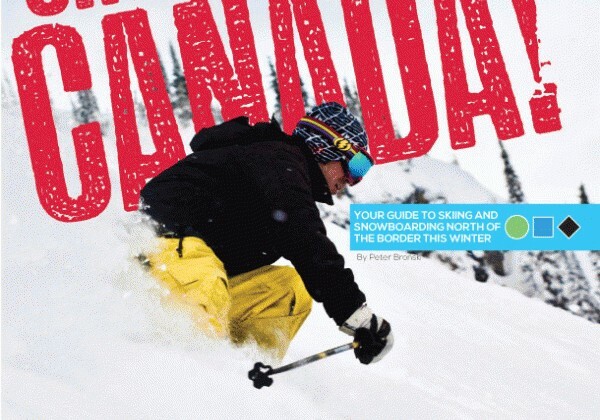 “O Canada” may be the official national anthem, but one taste of Canada’s slopes will have you exclaiming “Oh, Canada!” Best of all, the Old Farmer’s Almanac—that trusted source of meteorological predictions—is calling for above normal snowfall for both western and eastern Canada this winter. Sure, the US-to-Canadian dollar exchange rate isn’t what it once was. Nevertheless, if you’ve ever thought about making the trip north with your skis or snowboard in tow, the time to go is now (just don’t forget your passport). And this is your guide to six resorts—three in the west, three in the east—that are sure to deliver the goods. All offer mind-blowing options for experts, as well as challenging yet approachable runs for newbies. Choosing the one best suited for your getaway is just a matter of personal style and preference. There are two ways to log lots of vertical as a skier or snowboarder: Do laps on the chairlift at your favorite local hill or go to Revelstoke. The resort boasts the greatest vertical drop of any ski area in North America: 5,620’ (more than a vertical mile!). 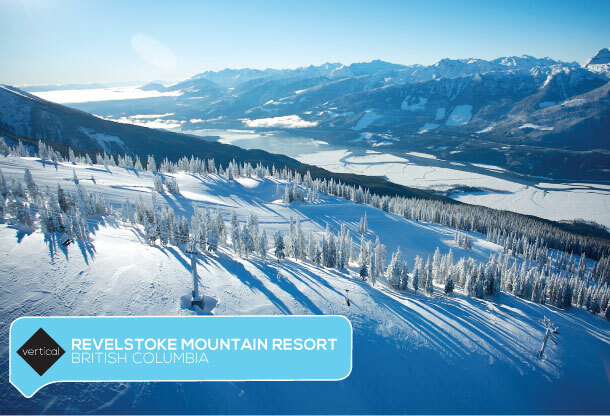 Located deep in the heart of British Columbia’s jagged Selkirk Mountains, nestled between Lake Revelstoke and Upper Arrow Lake, Revelstoke also claims to be the only resort in the world that offers lift-served, cat, heli and backcountry skiing all from one village base area. Its steeps on the upper mountain, plus 30 to 45 feet of annual snowfall make it popular with extreme skiers—one reason why events such as the “Swatch Freeride World Tour by The North Face” stop here. But Revelstoke has also expanded its offerings to the mortals among us. Now in its sixth season, the resort has unveiled more ongoing base area expansion and renovations, including the addition of La Baguette (a favorite of residents from the nearby village, featuring updated “ski hill” food) and Wino, an “alpine chic” wine bar, plus the posh Sutton Place Hotel for on-mountain lodging. As the largest ski resort in British Columbia and host of the 2010 Winter Olympics, Whistler-Blackcomb attracts a lot of attention. But Big White—the second largest resort in the province—deserves to be on your radar as well. For one, as its name implies, it’s big on snow. Located on the eastern flank of the Okanagan Valley, Big White feasts on “dry Okanagan champagne powder.” In fact, Ski Canada named Big White “best weather—if you like powder on your powder” in its Best of Skiing awards and Conde Nast’s Traveler named it “Best Snow in North America.” For another, Big White is big on accolades, especially in the family-friendly category. Snow Action Magazine named it “family ski resort of the year.” The Sunday Times (London) named it among the “top 5 family ski resorts.” And the Daily Telegraph named it number three in the “top 100 ski holidays” in the world for families. To wit, try out the public snow-cross course where you can race family and friends. Almost the entire base area is ski-in/ski-out, with a network of runs and lifts that shuttle you through the village and up the mountain. In fact, “Main Street” in the village is actually a ski run during winter! Big White boasts 18 restaurants, including bistros, a tapas bar and Kettle Valley Steakhouse and Wine Bar, which features Canadian beef and local game on the menu. The mountain also offers a full range of lodging options, from full-service hotels such as Chateau Big White to slopeside condos. When it comes to skiing and riding in the Canadian Rockies of Alberta, Lake Louise justifiably gets much of the attention. But Sunshine Village—near the mountain town of Banff—is a gem. The resort straddles the Continental Divide, as well as Banff National Park and Mt. Assiniboine Provincial Park. The terrain is divided among three major mountain faces that allow you to follow the sun: Goat’s Eye Mountain, Lookout Mountain and Mount Standish. In between Goat’s Eye and Lookout are craggy spires known as The Eagles. They host Delirium Dive, often voted one of the top 10 off-piste destinations in the world. This is serious big mountain, double black diamond territory—a partner and avalanche safety equipment are mandatory for entry. Even if you don’t venture into the Dive, the view from adjacent groomer runs is awe- (and potentially fear-) inspiring. Sunshine hosts nine restaurants, including a saloon, grills and fine dining at Eagle’s Nest Restaurant. Plus, Banff is a very short drive away for more options (banffdiningguide.com is an excellent resource). For ski-in/ski-out convenience, Sunshine Mountain Lodge is the way to go. Otherwise, options abound in nearby Banff, including the stunning Fairmont Banff Springs. 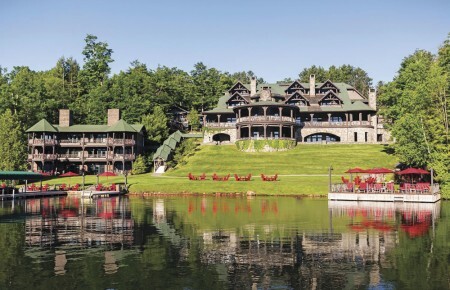 Don’t let its location in Quebec’s Eastern Townships region fool you. Despite the very English-sounding names of towns such as Sherbrooke, this is still the heart of French-speaking Canada. 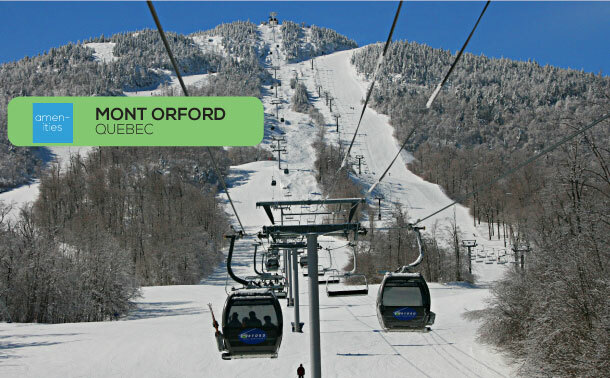 The Mont Orford ski station is the literal high point of one of Quebec’s flagship provincial parks. Three peaks—the namesake Orford, plus Alfred-des-Rochers and the bald, rocky, alpine Giroux—make up the ski area. Situated just north of Lake Memphremagog, Orford gets slammed by the same storm systems that drop plentiful snow over Vermont’s legendary Jay Peak. Orford features a unique hybrid gondola, with alternating six-person chairs and eight-person cabins. Meanwhile, the summit features warming yurts with roaring wood fires, a welcomed retreat if the weather gets bitterly cold and nasty. The nearby village of Orford and the larger, still-close-by village of Magog offer plentiful options for dining, ranging from classic regional cuisine to Mexican at Guacamole y Tequila to Italian at La Piazzetta. Ditto for lodging, where you have a range of options, from small B&Bs to condos to full-service resort properties. Plus, if you’re craving a break from the slopes, the Eastern Townships also boast a regional wine trail. Vignoble Le Cep d’Argent is one of the closest. Though it’s partially known for developing Quebec’s first sparkling wines, its fortified wines really shine. Try L’Archer, a port-style red fortified with grain alcohol and sweetened with local maple syrup in lieu of sugar. The Laurentian Mountains—a geologic relative of New York’s Adirondacks—sweep through Quebec north of Montreal. They are home to some of the oldest rocks on Earth. They’re also home to the highest concentration of ski areas in the entire province. 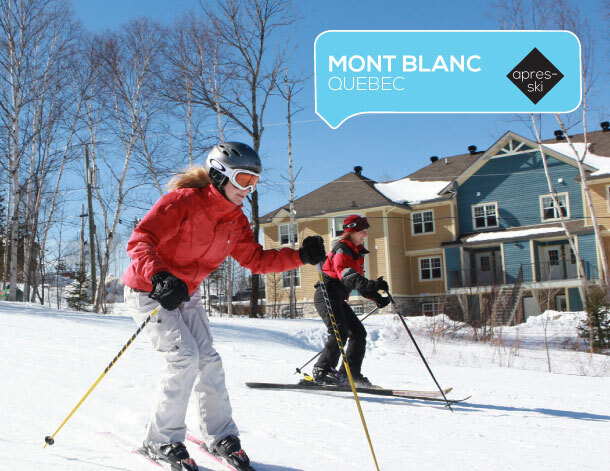 With 13 ski areas, the Laurentides region—northwest of Quebec’s capital—is the focal point. Mont Tremblant reigns supreme as the king of them all, though it sometimes carries a reputation for crowds from Montreal and New England. Most of the rest are smaller ski areas with modest vertical and modest amenities. But then there is Ski Mont Blanc, Quebec’s “white mountain.” Its vertical drop is second only to Tremblant, without the crowds. More than 40 runs are spread across three mountains: Mont Blanc, Mont Faustin and Mont Blanc Nord. It bills itself as a “true skier’s mountain,” and indeed, Mont Blanc delivers. A unique feature of the après ski scene here are the sugar shacks. Often same-family-owned for generations, they’re places where the sap from the region’s maple trees is turned into deliciously sweet maple syrup. In fact, the summit of Mont Blanc often features a sugar shack treat: Boiling maple syrup is poured into a trough of fresh snow and as it cools, you can scoop some up and eat it as a tasty snack. Nearby, you’ll also find places such as La Cabane à Sucre Millette, where you can enjoy a full sugar shack rustic dinner. Mont Blanc features ski-in/ski-out condos and a hotel, plus an onsite spa. The quaint village of Saint-Jovite—a metaphorical stone’s throw away—recently merged with the village of Mont Tremblant (not to be confused with the ski area, mountain or provincial park, all of the same name). Saint Jovite’s main thoroughfare, Rue de Saint Jovite, features an impressive array of dining options. Two popular spots include Restaurant Le Cheval de Jade and sEb l’artisan culinaire, where you’ll find locally-sourced fare on the menu, including salmon, clams, crab and lobster from the Atlantic maritime provinces, plus regional duck, rabbit and more. Orford has Lake Memphremagog, but Mont-Sainte-Anne has the mighty St. Lawrence Seaway at its feet. It boasts more than 2,000 feet of vertical drop, and the view from the summit lodge of the St. Lawrence far below is simply spectacular. The mountain’s front side is conveniently divided into three zones—Family Fun, Dragon and Expert—while the north side is likewise split—Family Fun, Progressive and Natural—so that the majority of the runs match your ability. 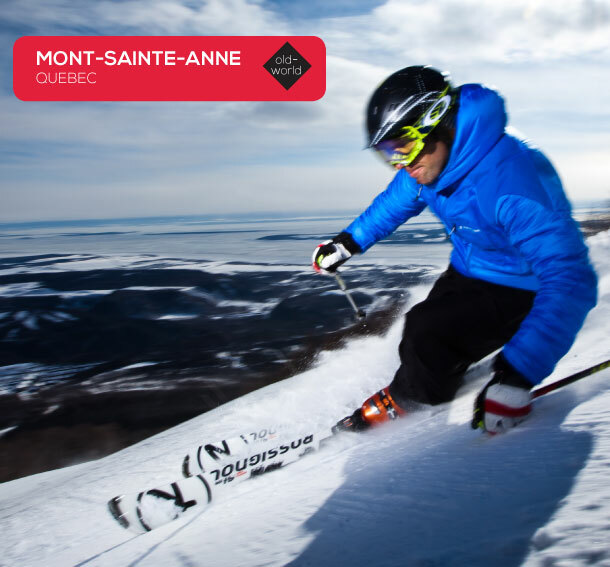 Mont-Sainte-Anne also boasts The Beast, one of the steepest ski runs in all of eastern Canada, plus the Black Forest glades, which are reportedly haunted by a ghost! You can also purchase dual lift tickets that are accepted at both Mont-Sainte-Anne and nearby Stoneham. Plenty of slopeside options for lodging exist, including the Chalets Mont-Sainte-Anne and the Chateau Mont-Sainte-Anne, which was renovated just over three years ago. But for a truly Quebec experience, stay in Quebec City, a UNESCO World Heritage site and one of the only walled cities in North America. It’s only 30 minutes from Mont-Sainte-Anne and very much worth the drive (there are also inexpensive ski shuttles to and from the city). You’ll feel like you’ve been transported to Europe several centuries ago. For lodging, the obvious choice is the grand Fairmont Le Chateau Frontenac. Plan your trip for sometime during February 1 to 17 to experience the Quebec Winter Carnival, a spectacle not to miss.